The Best Exotic Marigold Hotel is a true example of an ensemble piece where a group of veteran actors show that they are just as good as they ever were. The Best Exotic Marigold Hotel is a charming film that brings together a great cast to play a diverse group of characters. It’s the kind of ensemble piece that we just don’t see much of anymore in which a group of high-caliber actors play off of each other with ease, reminding us just how good they can be. Throw in a director who made one of the best films of all time and you have a film that is sure to delight just about any audience. 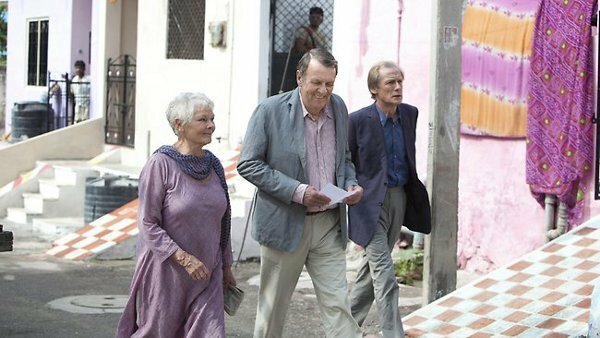 The film tells the story of a group of seven people, Evelyn (Judi Dench), Graham (Tom Wilkinson), Douglas (Bill Nighy), Jean (Penelope Wilton), Muriel (Maggie Smith), Norman (Ronald Pickup), and Madge (Celia Imrie), who, for various reasons, travel to India to stay at The Best Exotic Marigold Hotel, a resort for the elderly and beautiful, as their sign says. The film follows each of them as they explore the bustling city, learning not only about it, but also about each other as they spend more time together. What makes this a rather interesting film to watch is the interesting group of eclectic characters. Evelyn has recently lost her husband so she decides to do a bit of traveling, even ending up with a job at a call center in the process. Graham, a judge, has gotten fed up with the constant retirement parties he must attend and decides to return to India after 40 years to find a man he once knew there. Douglas and Jean, a married couple, are having a few issues at home with trying to find new housing, as well as having given their daughter his retirement money for an internet business. Their marriage is clearly not going well, something that only seems to get worse as they spend time in India. Muriel, a racist, is in need of a hip replacement and has been told that the process can be done cheaply if she is outsourced to a hospital in India. Finally, there’s Norman and Madge, who are both on the hunt for a partner. Director John Madden and screenwriter Ol Parker do a good job of incorporating these multiple storylines into a film where each and every character ends up getting plenty of screentime to have their tale told. While Parker doesn’t have anything particularly noteworthy in his filmography, most will remember Madden as the director of the great Shakespeare in Love, another ensemble film that required a balance of storylines. As mentioned before, this is an ensemble film, and the cast that was assembled is quite extraordinary. Dench, who won an Oscar for her performance in Shakespeare, brings her usual, delightful personality to the screen as a woman trying to figure out what to do with herself now that she’s alone. Maggie Smith has had a long and distinguished career of her own, taking home two Oscars in the process. Interestingly enough, the younger generation will know her quite well simply because of her appearances in all eight Harry Potter films. Her character in Marigold has some of the best dialogue and delivers a lot of the humor that lightens the mood. There are also those who some might not be particularly familiar with, such as Bill Nighy, whom some may know from Edgar Wright’s comedies Shaun of the Dead and Hot Fuzz while others will know the name from his work in two of the Pirates of the Caribbean films as the tentacle-faced Davy Jones, and Tom Wilkinson, another actor many would recognize even without knowing the name. Nighy also helps delivers a lot of the film’s comedy while Wilkinson injects it with a lot of heart as he searches for the man who had a big affect on him all those years ago when he was last in India. Rounding out the cast is Dev Patel, of Slumdog Millionaire fame, as the operator of the hotel. His character has a lot on his plate which includes trying to run a hotel while attempting to restore it to glory and dealing with a relationship with his girlfriend that his mother does not approve of. It’s all these performances that help give the film a good mix of comedy and drama in equal measure. To top it off, it was filmed on location in India, giving the film a beautiful look with multiple exotic landscapes. It may not be a particularly memorable film, but it’s a joy to watch so much talent on the screen, for if there’s one thing you’ll remember besides the gorgeous scenery, it’ll be these actors showing that they still have what it takes to pull in an audience and engage them for two hours.